Can a Gaudy Tart Change Her Spots? Hello there! Thanks for coming by to check on my doings – I love that you took the time! 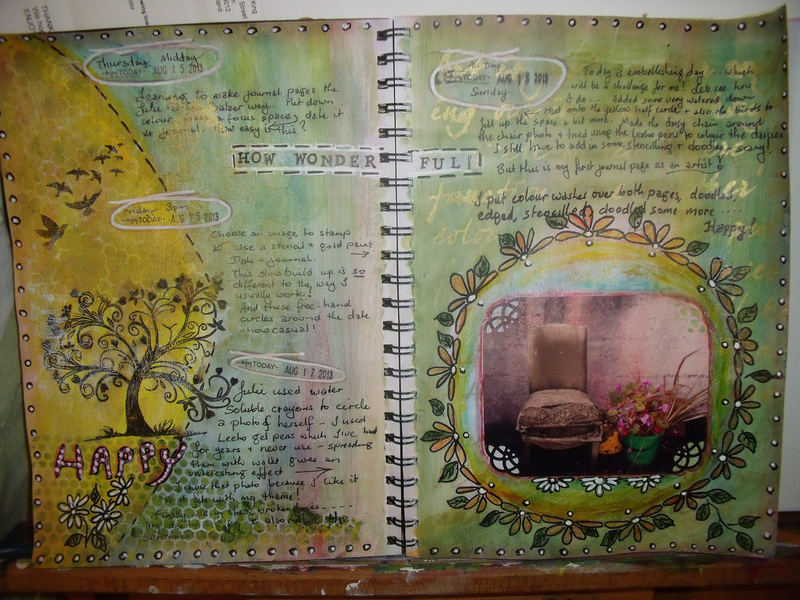 Right now I’m taking an on-line course in a [for me] totally new way of art journalling. By now you may be aware that I’m a kind of an ‘all or nothing’ gal – I work on things for hours, and sometimes even days, I don’t quit until it is embellished to death and the brighter the better! I started this on-line course so happily, a new challenge, I thought, would be good for me. I like to learn and I feel I have become a bit stuck in a rut – This, I thought, is my chance to change things up, to take a step towards becoming the artist I dream I might be one day when I grow up ….. But the reality is somewhat different – for a start it’s just ten minutes a day. When the time is up, it’s up. Put down your pencil-paintbrush-spray-pen-whatever and walk away! Oh, the indecision, the struggle – the sheer disbelief! It’s no good, I’m just talking to a pre-recorded video! If you look carefully you can see this is four days work – and when I look at it now I can’t see much difference between this and some of my previous journal pages that I have laboured over for hours …. Try as hard as could I couldn’t help myself and I did spend a little more time on the last day. I added in the black circles with white centres all around the edges of the pages, the white daisies under the photo of the old chair and the clump by the tree, and of course I doodled the ‘Happy’ word after time up as well … well, you just gotta have some bling somewhere! But, all in all, the colours are muted, the layout is simple, the embellishment is not 2D, the texture is simple. …. and I find I kinda like it ….. So, unlike the Leopard, maybe this gaudy tart might just alter her spots, just a little ….. This entry was posted in Art Journal, Creations From My Craft Room and tagged art journal, learning, Mixed Media, on-line course by thecontentedcrafter. Bookmark the permalink. Please don’t move on, stay a while 🙂 Thank you for your visit – I love your site! That looks like so much fun. Good for you for trying something new. I’m trying to do more of that as well. I love your nickname…gaudy tart. So darn cute. It turned out wonderful, I love the layout!